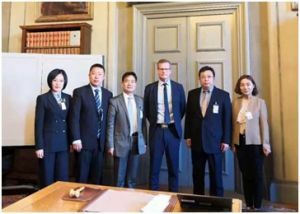 In October 2018, the China National Green Public Procurement (GPP) delegation conducted a 10-day learning visit to six Nordic cities. The delegation visited Copenhagen, Malmö, Gothenburg, Stockholm, Oslo, and Bergen - many of which are already Procura+ Participants. This visit was hosted by the Procura+ Network as the first international exchange event between the East Asian and European counterparts since the launch of Procura+ East Asia in May 2018. The delegation consisted of six high-level officials from the Ministry of Finance, the China Quality Certification Center (CQC, a Procura+ strategic partner), Jilin Provincial Government, and China Finance and Economics Newspaper. The overall aim was to experience cutting-edge cases of green procurement policies and practices. Nordic cities developed their GPP practices based on EU policy schemes, but have incrementally increased their standards in terms of sustainability. The well-established and sophisticated GPP mechanisms at respective Nordic cities are valuable for China GPP policy makers to refer to, contributing to the current research of establishing a national GPP scheme in China. During the visit, Fangming Guo, Deputy Director General of the Treasury Department of China’s Ministry of Finance, shared an overview of the current GPP policy landscape, on-ground implementation, and the Government Procurement System Reform in China. Furthermore, he shared insights toward the latest development and achievements in crafting an integrated government procurement legal system and advancing information release. The Nordic audiences appreciated and congratulated the rapid development and expansion in scope of GPP in China. Established in 2003 by ICLEI, Procura+ is a network of public authorities around the globe to connect, exchange, act on sustainable, green and innovation procurement through meetings, seminars, and discussion forums, with Procura+ active in Europe and Procura+ East Asia active in East Asia. Managed by the ICLEI East Asia Secretariat with support from the ICLEI Global Sustainable Procurement Center, Procura+ East Asia supports local governments from China, Japan, Korea and Mongolia in achieving sustainable and low-carbon development goals through sustainable, green and innovation procurement.